Background: The root of the Indonesian Pimpinella pruatjan Molk. has been mainly used as an aphrodisiac and for the treatment of Erectile Dysfunction (ED). Since oxidative stress favors ED, we examined the antioxidant activities of the essential oil from the root of P. pruatjan. Methods: The chemical composition of the essential oil was analyzed by Gas Liquid Chromatography- Mass Spectrometry (GLC-MS). 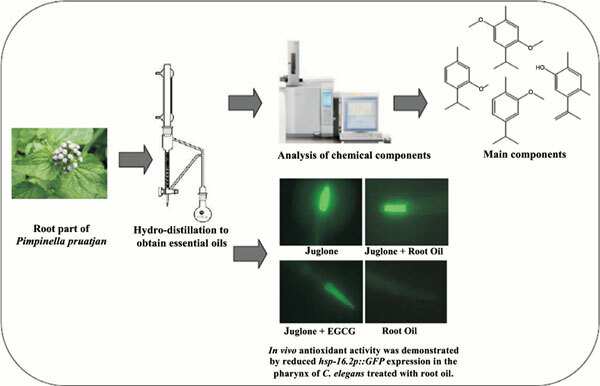 In vivo antioxidant activity was determined using an animal model, the nematode Caenorhabditis elegans, whereas the antimicrobial activity of the essential oil was investigated using standard micro-dilution methods. Results: The main components of essential oil were thymol methyl ether and 2,5-dimethoxy-pcymene; another major compound was tentatively identified as 2-isopropenyl-5-methyl-benzene-1,4- diol. Root essential oil showed substantial in vivo antioxidant activities, demonstrated by reduced hsp-16.2p::GFP expression in the pharynx of C. elegans and increased survival of worms under acute stress conditions. Antimicrobial activity showed moderate activity against bacteria and Candida yeasts. Conclusion: The antioxidant property shown in these findings needs further investigation, especially with the major active compounds. Keywords: Pimpinella pruatjan Molk., Apiaceae, essential oil, antioxidant, Caenorhabditis elegans, antimicrobial. Keywords:Pimpinella pruatjan Molk., Apiaceae, essential oil, antioxidant, Caenorhabditis elegans, antimicrobial. Abstract:Background: The root of the Indonesian Pimpinella pruatjan Molk. has been mainly used as an aphrodisiac and for the treatment of Erectile Dysfunction (ED). Since oxidative stress favors ED, we examined the antioxidant activities of the essential oil from the root of P. pruatjan.